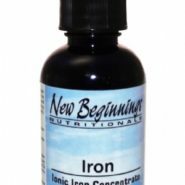 New Beginnings Nutritionals offers an ultra concentrated blend of ionic liquid iron that mixes easily into water or juice. Ionized minerals are very bio-available because they are easily recognized and absorbed by the body, which results in better utilization and assimilation into the cells. The body’s ability to utilize a mineral is primarily a matter of size and solubility. If the mineral particles can be reduced down small enough, they can then be absorbed by the body without the need for them to be broken down into a less usable form through the process of digestion. The most important issue for absorption of a mineral is making sure it is in its ionic form. The dominant factor is that the mineral must be freed from whatever matrix it is contained within so it can be recognized and taken up by the body. 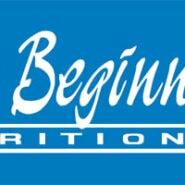 Being in its ionic form helps the body recognize and more effectively utilize the minerals. Iron, an essential mineral, is part of hemoglobin, the oxygen-carrying component of the blood and part of myoglobin, which helps muscle cells store oxygen. Symptoms of iron deficiency include weakness, fatigue, decrease in physical performance and learning problems. Without enough iron, adenosine triphosphate (the fuel the body runs on) cannot be properly synthesized. Iron should only be supplemented when blood levels show a deficiency and when under the supervision of a healthcare practitioner. Suggested Dosage: Adults take 10 drops daily with 12 oz juice or water. Children take 5 drops daily with 12 oz juice or water. Do not take on an empty stomach. Shake well before using.